So back to the film stats. It turns out that nearly 1/3 of the top selling films of all time are sci-fi and they account for just under 1/3 of the gross income for the top 50 (that’s about 28% or $13.2 Bn). To which we can add other big films like the Terminator, Alien and Star Trek series who fall outside the top 50. Simply this – how come there are so few top selling books that are sci-fi? I don’t believe for a second that sci-fi lovers don’t buy or read books. This entry was posted in adventure books, author, book series, children's book, ebook, entertainment, fiction, future of print, great books, great new book series, middle grade, sci-fi films, science fiction, sean yeager, sean yeager adventures, self publishing, star wars, teen read, tween read, writing, young adult, young fiction and tagged action, adventure book, book, book for boys, book news, book review, children's book, film review, good book, great new book series, middle grade, reaching readers, reviewing, sci-f films, sci-fi, sean yeager, teen book, tween book, young adult on December 9, 2012 by D.M. Jarrett. Just like my evil nemesis Egbert Von Krankhausen I never give up in waving a virtual flag at those readers who are seriously missing out on a good thing. I mean come on everyone over here! Aren’t you bored of vampires yet? Sean Yeager awaits! The true spiritual successor to Parry Hotter and Dartemis Owl. In a move that is bound to spread tremors and tsunamis across the world I am transporting Sean Yeager to a whole new dimension for the holiday period. A dimension of lending. That’s right the Kindle lending scheme. Now you have no excuses – read and enjoy! Or I’ll send Krankhausen after you…..
Is it life Jim or is it opting for the inevitable? I’ll beam up again soon with news from the front. One thing is clear there will be no cosy little romance picnic to spoil the action. Yes that is a direct dig at Star Wars who made me cringe for what seemed like eternity with that dire excuse for a love story between ‘To be Darth’ and ‘Oh look I’m pregnant with twins and the best sci-fi gizmos and forces ever can’t save me’. This entry was posted in adventure books, author, book series, children's book, ebook, entertainment, fiction, film review, great books, great new book series, harry potter, middle grade, promotion, publishing, sci-fi films, sean yeager, sean yeager adventures, star wars, teen read, tween read, writing, young adult, young fiction and tagged action, adventure book, book, book for boys, book news, children's book, comedy, ebook, film review, funny book, george lucas, good book, good writing, great new book series, james bond, middle grade, mystery book, promotion, reaching readers, reviewing, sci-f films, sci-fi, sean yeager, star wars, teen book, tween book, writing, young adult on November 29, 2012 by D.M. Jarrett. Sean Yeager Hunters Hunted is progressing well and is on track to see the light of day by early next year. It will be the second in the Sean Yeager series with another great cover and an elaborate, action packed story. It builds from the first novel and follows Sean Yeager and his new friends on their quest to recover a mysterious artifact. Of course in true SYA fashion the mission is far from straightforward thanks in no small part to Sean’s new found enemies and the intervention of The Foundation in a purely protective role you understand…. 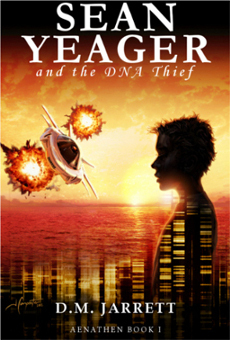 Sean Yeager and the DNA Thief will soon be available in print to satisfy all the bibliophiles out there. This will be a slight revision on the original version, not that most mortals will spot the different (Yes you may take that as a challenge if you wish) Of course the e-book version will continue to be available. The film may take a while to sell and produce….. Please feel free to forward the SYA links to anyone you know who enjoys adventure sci-fi. All the main links are listed on the website for ease of navigating. Things are beginning to really hot up around here…. In future we’ll possibly / probably put up some more artwork on the website, but don’t hold us to it as we have lots of other things on the boil. This entry was posted in adventure books, author, book series, children's book, ebook, entertainment, fiction, great books, great new book series, middle grade, promotion, publishing, sean yeager, sean yeager adventures, teen read, tween read, writing, young adult, young fiction and tagged adventure book, book, book for boys, book news, children's book, ebook, funny book, good book, great new book series, middle grade, mystery book, promotion, reaching readers, sci-f films, sci-fi, sean yeager, teen book, tween book, writing, young adult on November 26, 2012 by D.M. Jarrett.